A few weeks back I was making dinner for my in-laws before their annual trek down to Florida for the winter months. I chose a pasta recipe that sounded really good and picked up all the necessary ingredients. Upon further review of the recipe as I was about to start cooking, I realized that I had somehow missed the fact that the recipe was for a cold pasta salad. This was not exactly what I was looking to eat on a frigid January evening. Instead of scrapping the whole thing, I figured I could turn it into a warm dish pretty easily. So rather than cooking and chilling the pasta, then tossing it with the cold sauce, tomatoes, and olives, I decided to warm the sauce a bit and cook everything for a few minutes, then toss in the cooked pasta at the last second. As I tossed the pasta in the pan, I was amazed at just how good everything looked. It turned out to taste just about as good, and was pretty easy to make. The first time I made this dish I used gemelli pasta, which was great. 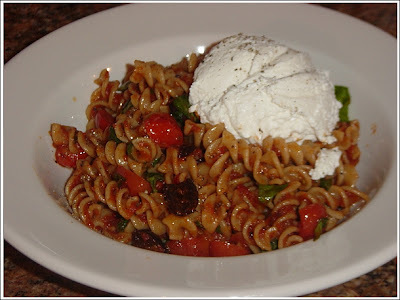 When I made it again last night, I subbed in whole wheat fusilli, and must admit, that the overall dish did not look quite as good with the brownish pasta, but still tasted great (and was healthier too). Once you have all your ingredients prepped, this one comes together really fast so don't put the sauce in the pan to warm until the pasta is just about done and ready to be drained. First chop the garlic, slice the tomatoes and olives, and get all your other ingredients together. Take the ricotta cheese out of the fridge so it is not ice cold when you serve it, which would blunt the flavors of the dish a bit. The sauce ingredients go into the food processor. The sauce ingredients get pulsed a few times, then the oil is added in a drizzle with the machine running, making a thin, somewhat chunky sauce. Once the pasta is just about done, warm the sauce in a pan over medium heat. When the sauce just starts to bubble, add the tomatoes and olives and cook for about 2 minutes. Add the pasta and toss to combine. Remove from the heat and toss in the fresh chopped basil. Spoon the pasta into bowls and top with about 1/4 to 1/2 cup of the ricotta cheese. A little fresh ground black pepper and you're good to go. The amazing thing about this dish is the incredible contrast between the cool ricotta cheese and the warm, pungent sauce. I like to have a huge dollop of cheese on top rather than combining it completely, that way you can take a little bit of cheese with each bite, rather than mixing it into the entire dish. If you wanted to make this one a bit healthier, you could eliminate, or at least cut down on the amount of ricotta, use whole wheat pasta, reduce on the amount of oil in the sauce, or use sun dried tomatoes stored dry rather than in olive oil. I don't think any of these changes would really cause the dish to suffer greatly, as there's a ton of flavor in the olives and capers. Try one or all (or none) of the suggestions and see what you like. Whatever pasta you end up using, just make sure it is something curly or with plenty of ridges to hold the chunky sauce. Some type of bread is also a must with this dish, to mop up all that sauce left in your bowl. If you like bold-flavored pasta dishes, this one will definitely find its way into your regular rotation.